It took my girlfriend (now my wife) about 6 month after we first dated to find out I was doing martial arts. She found out when told by my mom one time she phoned at home while I was at practice. Had it not been for that phone call, I would have delayed telling her about my "activities" for as long as I could without her questioning me on my whereabouts during practice time. To the uninitiated, martial arts is EXACTLY like what they see in movies. In their minds, your skill level is only surpassed by Chuck Norris. Its not that bad for them to think you are invincible, until they start introducing you to new people as a "martial arts expert a.k.a. fighting champ". It gets worse when in your company, they get added bravory and then starts picking fights with strangers on the basis that you can defend him against a dozen of potentially armed thugs/gangsters. "You do karate? Then you must be like him!" They say "if you aren't worth a laugh, you aren't worth much", well being a martial artists sometimes doesn't feel like much. I lost count of how many times I was mocked when I was being introduced as a martial artists. The mocking often translates as the new acquaintance doing their "comical" version of a kata/form, all the while making high pitched "Bruce Lee style" sounds. Some go as far as to mock hit you in the face. Those are the times where it is tempting to remind such jokers that there is nothing funny about practicing a martial art... by punching them in the stomach! Unfortunately, martial morals condemns such unnecessary violence. "You do martial arts? So you I! WooooOO AiyAA!" Challenges are most often issued by practitioner of another martial arts system with an over inflated ego. Sometimes, they are issued by tough guys who have always relied on their big muscles to solve their problems. Some feel they need to test themselves against a worthy adversary to prove their worth, others are just trying to ridicule you for dressing up in pyjamas, pretending to fight imaginary enemies. This again opens yet again another situation where unnecessary violence is invited when a nice conversation around a beer would have been the norm. "I dare you to break all those bricks"
"Wow! You do kung fu! Can you do a demonstration?" What they really want is for you to impress them the same way action movies impresses them. If you happen to practice a fairly flashy martial art, like Tae Kwon Do, Wushu or do XMA, then its not much of a problem. What if you practice a more combat oriented, more down to earth martial art, like Wing Chun, Mixed Martial Arts or any kind or reality based style? Those style usually incorporate the most direct methods, which also happen to be simple, and effective but otherwise unimpressive? With such strength and balance, this guy must be the greatest martial artist ever! 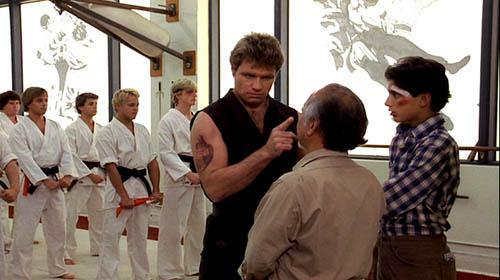 Here is what one of my karate sensei reacted when asked to do a demonstration for mocking construction workers: he punched the toughest one in the gut while releasing a loud shout (kiai). He didn't mention if he released the full power of his punch or not, but seing how he is not in jail, we can assume he released just enough to "impress" the worker. 5- Often asked questions to which the asker cannot possibly comprehend the answer. The most notorious question, in my humble opinion is: " Why do you practice martial arts when you can easily get guns / knifes / pepper sprays to defend yourself?" That may very well convince him to join on your next training session, if his questioning was to further convince himself of his need of martial arts training, but it could also be the basis for a long and annoying argument, where he annoyingly dismisses every one of the reasons you previously stated. If such verbal fight occur, you may be subjected to "brother-in-law" type of advice. If you have a brother in law, you know exactly what I am reffering to. You know when they give sound advice, and then there is a lot more sound than advice... That's the brother in law type of advice. Mind you, they are well-meaning, but unless they themselves practice martial arts, they often do not possess deep understanding of martial arts. But perhaps, not to be outbeat, they show their martial arts knowledge by using statements like: "What you do is good, but <insert style> is more efficient because <insert unverifiable reason>." If you get into an argument, then your wife will be mad at you for "disrupting family unity" because you belittled your bro in law. The alternative is to listen, nod, smile and thank him for his insights, which may make your ears bleed. In any case, it is a lose-lose situation. * "Brother in laws" is just a generic description. My brothers in law are great and knowledgeable people. In fact, I wish they would impart me with their opinion and insights regarding martial arts. Granted, having a blog isn't very secretive, but at my age, who cares anymore! Do you keep your training a secret? You are welcomed to leave a comment.